Welcome to Popular Cinema Survey, an ongoing Fade to Lack feature in which I explore the worlds of blockbuster and commercial cinema. Our first ongoing subject in this series, as introduced here, is the most successful blockbuster cinematic venture of all time: The James Bond films. We shall spend 23 weeks watching and discussing all of the canonical 007 pictures (as produced by Eon), in order, once per week on Fridays. 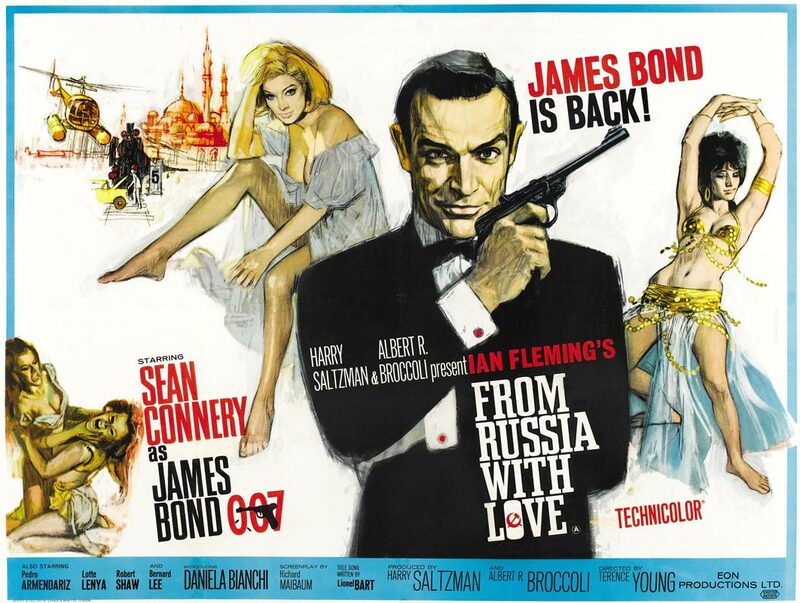 We continue today with the second film, From Russia With Love, from 1963. From Russia With Love does what all good sequels should do: It uses the excellent foundation laid by its predecessor and goes darker, deeper, and bigger with nearly every aspect of the material. Bond’s actions in Dr. No have put him on the map, and international crime syndicate SPECTRE now wants him dead, devising an elaborate plot wherein they may obtain a sophisticated cryptographic device and kill 007 in one fell swoop. 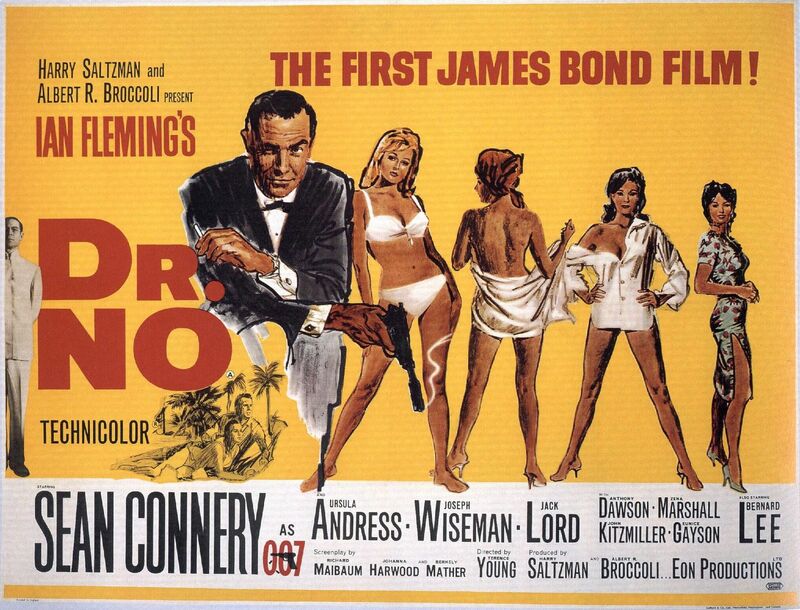 I am always surprised, when returning to Dr. No, at what a clear, thorough handle Eon (specifically, producers Albert R. Broccoli and Harry Saltzman, the key creative voices behind the entire series) had on James Bond from the very beginning. 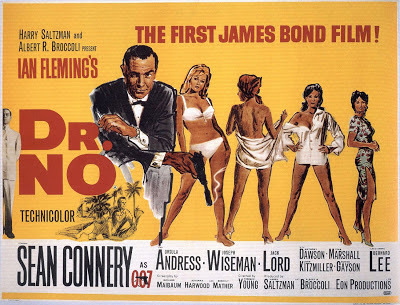 Some of the major stylistic flourishes, like movie-specific theme songs, elaborate opening credits sequences, and impossible death-defying stunts, would not come into their own until later, but 007 himself is fully formed from his first scene, when Monty Norman’s legendary musical sting, Sean Connery’s effortlessly confident performance, and Terence Young’s impeccable eye for dramatic, suggestive framing all work in harmony to announce that Bond is indeed the coolest man around, even if he’s just playing cards. Welcome to Classic Anime Re-watch, an ongoing Fade to Lack feature in which we revisit a classic television anime. Our first ongoing subject is one of the great anime of the 2000s: Fullmetal Alchemist (the first series, from 2003). 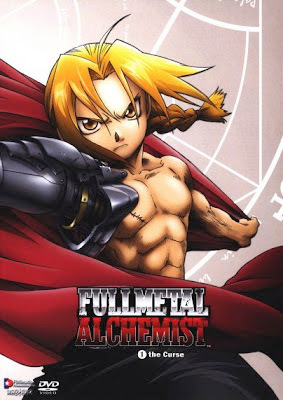 I will critically analyze each episode’s story, themes, and characters, explore where it all lines up and deviates from the manga, and look at the production values as well. 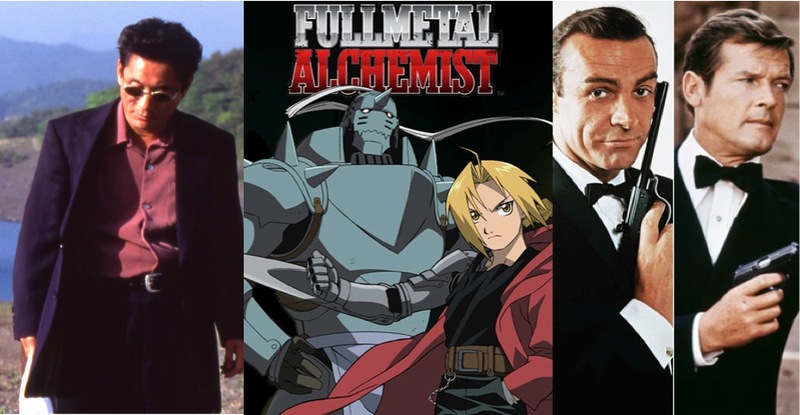 To make things simple, we are covering 4 episodes every week (one DVD volume in the original North American release from FUNimation), and the entire series is currently streaming on Netflix. Today, we cover Volume 1, including Episodes 1 through 4. Enjoy! A couple quick notes on the format before dive into the analysis: After careful consideration, I have decided that the best way to tackle this series will be episode-by-episode, at least in the early going (two-parters like the premiere will be combined), so that is what you see below. Also, if this is your first time watching through the series, I am glad to have you – there are no spoilers for future episodes in these reviews (but you should, of course, watch the episodes being discussed each week before reading that specific article) and you can feel free to watch along with me. This week’s review is quite a bit longer than subsequent installments will be, given that there is a lot of initial ground to cover, including a brief discussion of the show’s first set of Theme Songs. Welcome to Director Spotlight Series, an ongoing Fade to Lack feature in which we study the works of a notable filmmaker, movie by movie, for an extended period of time. 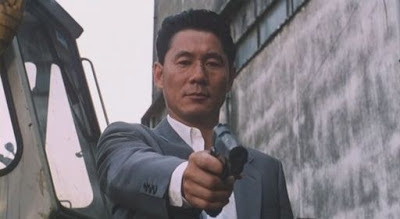 Our first subject is renowned Japanese director Takeshi Kitano, one of my favorite filmmakers of all time and a fascinating artist who has never gotten enough attention from English-language critics. For the next 16 weeks, we shall explore his filmography in depth, moving chronologically to analyze one film every week. We begin with his wonderful 1989 debut feature, Violent Cop (Sono otoko, kyōbō ni tsuki – “That man, being violent” in the original Japanese). Enjoy! Before getting started, a quick note on availability: The films of Takeshi Kitano are, by and large, currently unavailable in the United States. Most of his films have seen DVD releases here, but many of those were in absolutely horrendous, unwatchable quality, and are now out of print. Violent Cop falls into this category. The easiest way to access the film in North America at present time is to stream it on Hulu; the quality is pretty rough, but watchable, although there are, unfortunately, ad-breaks that interrupt the experience. But for those seriously interested in this and other Kitano films, I would recommend importing a DVD from abroad. The best in-print DVD release of the film is Second Sight’s Region 2 UK edition, available from Amazon UK. You will need a region-free DVD player to watch it, but the quality is quite good, featuring proper color-timing and anamorphic widescreen, and it contains an informative hour-long documentary on Kitano’s career. Summer has arrived, and that means it is time to finally get this blog going again. See, it turns out that publishing a book, taking a full slate of college classes, and working as frequently as I can for an increasingly popular entertainment website – all in the months after losing my father – was the perfect recipe for absolutely killing my overall writing output. Writing is what keeps me sane, happy, and sharp, and lately – for the reasons stated above and a variety of others – I have not been doing enough of it. So far, my output in 2013 has been far less frequent than any other period in my life going back to 2007, and I want to change that. I owe it to myself and I owe it to the reader base I have cultivated over the years, many of whom I have been getting e-mails, comments, and questions from over the last few months. Basically, all I have made time for lately is new movie reviews – and far fewer than I would like – over at my professional home of We Got This Covered, and while I enjoy reviewing new movies – it is the basis of what I do – my life and career feels fuller when I do more. Especially in a year like 2013, where there have certainly been some real theatrical gems, but also an inordinate amount of mediocrity to make me increasingly less enthusiastic about reviewing new titles. But the point is, I do not feel a weekly movie review or two is enough. I miss writing about television. And classic films. And other entertainment topics that my own recent limitations have not allowed me to cover. So I am announcing today three new ongoing retrospective series that will be publishing weekly, exclusively at this blog – now permanently rechristened Fade to Lack – for the entirety of June, July, August, and beyond. Starting next week, a Director Spotlight Study, Classic Anime Re-watch, and Popular Cinema Survey series will all begin their initial runs, with explorations of a legendary anime from my adolescence, a revered Japanese director who does not have nearly enough exposure in the English-speaking world, and a popular cinema franchise that recently celebrated its golden anniversary providing the first set of subjects.